Ella Levine, national director of FIDV in America, explained her commitment to Israel and its wounded veterans: “As a child of Holocaust survivors, I grew up in a home in Soviet Lithuania without having a grandparent, aunt, uncle, or cousins. I knew that a day would come when we would have to leave, again, as my mother used to say. But if we will be lucky, we will leave for a place where nobody will be afraid to be called ‘a Jew’. It was in Israel that I learned what it meant to be one among equals; it is there that I faced, at a very young age, the meaning of living and being an Israeli citizen,” Levine remarked. It is in Israel that people like Izzy, and 51,000 other disabled veterans, depend on us. These are the men and women who fought for all of us, and now, with much pride and honor, are trying to heal and return to the community. There are many ways to help a veteran restart an education, learn a trade, find a profession, navigate the complex world of disability. We also can teach the spouses and children of our wounded veterans to embrace a new reality in their lives. What I am asking you to do now is to become a friend, a supporter, a partner of FIDV as we support the work of Beit Halochem in Israel. The same love an enthusiasm for Israel and her disabled veterans was evident at the home of our Boynton Beach chair, Al Ben Ness, his wife Haviva, and a group of committee members, all volunteers, came to talk about plans and activities for 2013-2014. They, too, have been involved for many years, trying to spread the word about FIDV-Beit Halochem, educate people about the organization and its needs, and raise money for different projects and centers. “We need to bring our name into a much broader audience, we need every new friend we can reach out to,” Al Ben Ness emphasized. “Tell your friends and family about helping our veterans – they deserve it”. 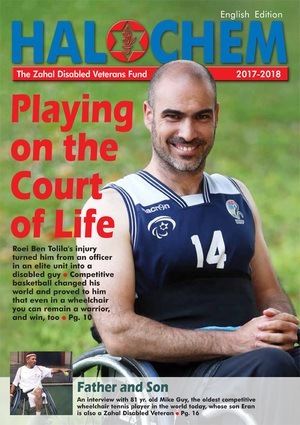 No matter where you live, you can be part of a group supporting Friends of Israel Disabled Veterans-Beit Halochem. Please contact Ella Levine, National Executive Director and we will help you start a group!